Stir-fried noodles in Shanghai-style have some features that are very different from Cantonese one - Shanghai style the noodles are bigger, the sauce is darker, it uses cabbage and a bit of sugar which both give out a very mild sweetness in taste. 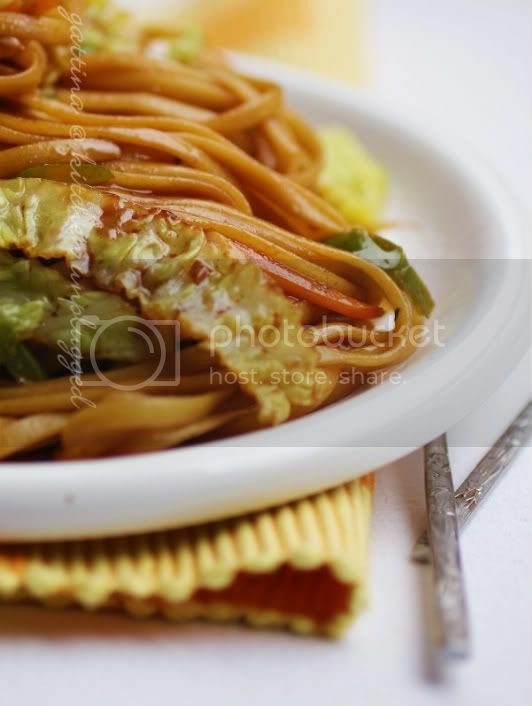 This style surely brings you a nice change from salty Cantonese noodles with bean sprouts. It is sad that the family-run Shanghai restaurants are found less and less in Hongkong. Their dishes are hundred times tastier than the chain restaurants'. Besides, there could be many interesting things going on in a tiny restaurant, like, ladies and children (usually relatives of the owner) taking over the biggest table for making dumplings, or some 'clogging' sound - the chef wearing wooden clogs - was echoing around the tiled-walls... The owner and workers were always Shanghaiese, whether their cooking different from their home town's I couldn't tell, but their dishes were very shinny (as a lot of oil) and always carried some wine and sweet taste, I just love that! Bring a big pot of water to boil, add a pinch of salt and the noodles, cook until just right. Drain and rinse the noodles under the tap immediately, drain and set aside. In a big skillet, pre-heat some oil and stir-fry the carrot and pepper with a pinch of salt for 2 minutes, scoop them on a plate and set aside. Use th same skillet to stir-fry the garlic, cabbage, oil and a pinch of salt until the veg looks soften, then add a small cup of water and the chicken powder, cook the cabbage over medium-low heat until it cooked. Raise up the heat and stir in carrot, pepper, noodles and the sauce until everything heat through. Taste and re-season if necessary. Serve hot, it goes well with any Chinese dishes. They look so comfy and pretty I bet they are delicious. Looks delicious. Lovely comfort food. So beautiful, fresh, and delicious!Very comfort and thanks for the complement.. Fantastic! I love stir-fried noodles! Lovely noodles, so tasty and so good. Of course you make them look beautiful as always. 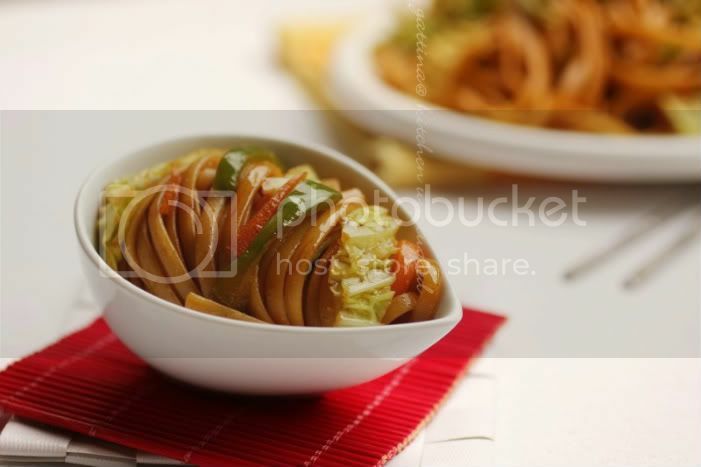 Look at perfection - I love how the noodles are plated (bowl) in the first photograph.